The Snake Horoscope 2016 predicts that the year 2016 will find you free to take actions in all matters without any hindrances. Your communication skills will be excellent, and you will be able to market your products and ideas with ease. Planetary aspects will provide you with extra vitality compared to previous year. You will follow your intuition which will provide you with good results. Your actions will be preceded by detailed thinking and planning. Snakes, explore new avenues in life which you can follow after thorough scrutiny and avoiding haste. Do not be overconfident and take up things which you cannot complete. As life will be hectic in the Year of the Red Fire Monkey, you have to organize yourself and deal with situations peacefully. The 2016 Chinese astrology forecasts suggest that you slow down your pace in the middle of the year as any rashness will affect your emotional and fiscal health. All decisions should be taken after proper dialogue with all the people concerned. The Snake Chinese zodiac sign should not be carried away by the charming ways of their partner during the last part of the year. Make a realistic assessment of the relationships without getting attracted by the outward appearances. The Snake 2016 horoscope predictions also foretell that you will be looking for relationships which are capable of fulfilling your romantic desires immediately. You will be following these with all your heart and stubbornness. You will be seeking relationships with more sexual passion and romance And, this will be done with force and by taking risks if required. You do not mind expressing your feelings more openly. Snakes, there will be contradictions in your love life. While you have the emotional strength to be passionate with your present mate, you are also trying to form new relationships outside. If you are in a committed relationship, you will feel like walking down the aisle with your partner in 2016. You have to be careful while doing so, as planetary aspects are not suitable for permanent relationships in 2016. The partnership with a Snake may break down and you will be running after a new love mate. Marriage should be contemplated only after strong bonding and high level of understanding suggests the Chinese astrology compatibility calculations. Married people may face problems with their spouse as professional life will get priority over marital life. News of pregnancy is also on the cards, suggest the 2016 Snake predictions. 2016 promises to be a challenging year for professional people, forecasts the Snake 2016 predictions. At the workplace, your stubbornness to accomplish should not threaten others, and deter them from expressing their views. You will be able to convince others and push through your ideas only if you are not overbearing and caustic in your remarks. All conflicts should be avoided, and a cordial atmosphere should be created. Read about the snake animal totem. The Chinese zodiac predictions 2016 for the snake foretell that planets are giving you many fresh openings in the period between April and June as well as in October. You should take up these opportunities and follow them up with extra energy. If you try to bring in major transformations in your approach to execute them, it may bring more frustration. All the jobs should be implemented with proper planning, and you should have an optimistic view of things in the Year of the Monkey. The 2016 Snake horoscope forecasts that financial situation will cause major worries during 2016 and this will affect both your physical and emotional health. However, this does not prevent you from making considerable progress in social and career fields. During the month of November 2016, you will make efforts to make your personal way of living more comfortable and luxurious. Get your 2016 horoscope predictions to know more. You may face some difficulties in covering your expenses with the available earnings. Snakes, all unnecessary purchases should be avoided in 2016. Do not be generous in lending money to others as this may affect your finances over the long run. You should use your financial intelligence to find out ways to stretch your necessary expenses over a longer duration. 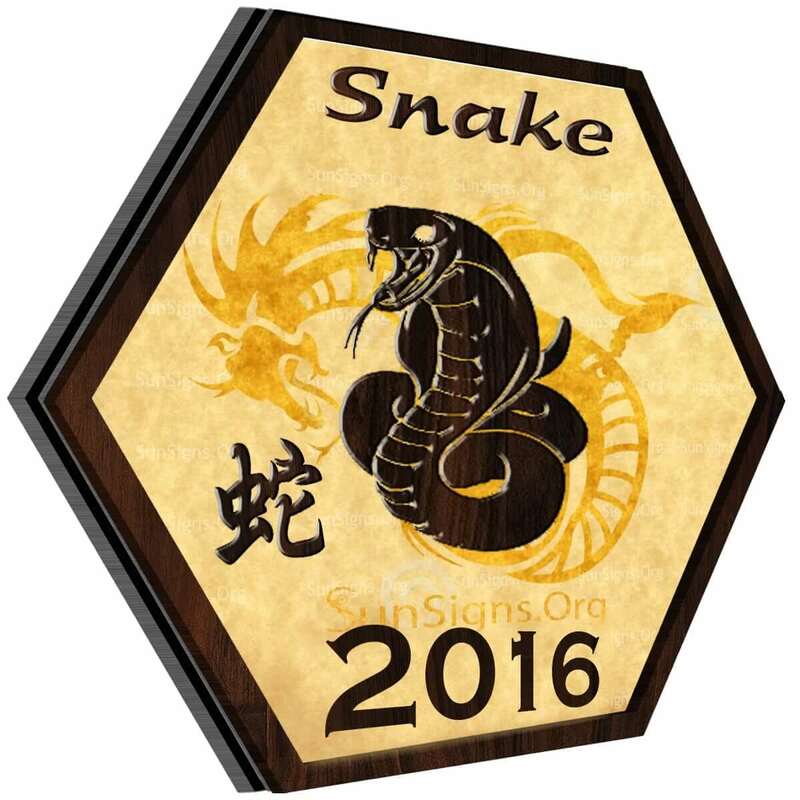 The Snake horoscope 2016 foretells that health will be fabulous between the months of May and August 2016. Your enthusiasm will drive you to follow your goals in life with vigor, and it is necessary that you slow down your pace. You should indulge in athletics and sports as your physical fitness is excellent. Period from August will provide you with extra vitality which may make you violent. The extra energy should be directed for productive purposes. Last quarter of the year of the monkey 2016 will see you expending your energy on useless things. All treatments with water such as sauna will revitalize your fitness. The 2016 Chinese zodiac predictions ask you to listen to your inner voice while improving your fitness. The 2016 Chinese horoscope for Snake forecasts that the relationships you form between May and October 2016 will be hampered by your wish to be more free. If required devote more time to yourself and your personal work. Relationship with children will be harmonious and it is time to strengthen the ties with them. The Feng Shui yearly forecasts 2016 for the Snake suggest that you do let your emotions get out of hand as they might affect your relationships. To conclude, the 2016 Snake horoscopes predict that the coming year will guide you into getting back on track when it comes to achieving your goals.